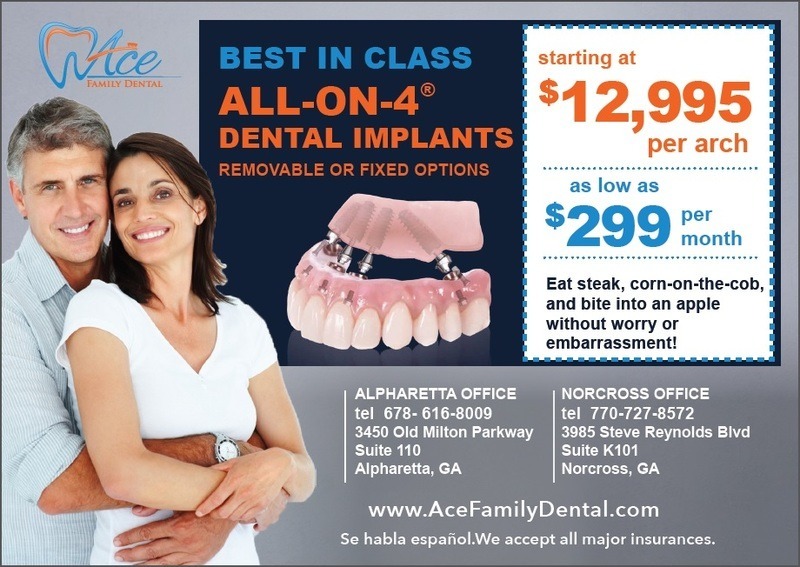 Ace Dental is offering All-On-4® dental implants. Biting into food like an apple, steak, or corn-on-the-cob are completely possible and effortless. The All-On-4® is a screw-retained device, supported on as few as 4 dental implants, and replaces an entire arch of teeth. It is the most functional choice and performs like your natural teeth. It is a permanent solution without covering the roof of your mouth, and gives you up to 95% of your chewing ability, compared to traditional dentures. If you are currently struggling with your dentures, or are missing teeth, the All-On-4® is for you! It is an excellent procedure for patients who have a complete denture or are missing most or all of their teeth. It is unfortunate, but losing teeth are a common happening among adults. In the United States alone, there are 25 million people missing all of their upper and or their lower teeth. Because of dental implant technology, there is no need for the discomfort and hassle that comes with dentures. Instead, opt for All-On-4® dental implant restoration. With the use of just four implants, all of your teeth on either the top or bottom of your mouth can be replaced. It will be fixed into place, feels and function like natural teeth. After you choose this procedure you will be able to eat and enjoy all of the foods that you love. You can bite into an apple, you can eat raw vegetables like salads easily, you can also enjoy meat. A lot of people enjoy corn on the cob and that also is really easy to eat. They look beautiful and natural and patients absolutely enjoy having them. We want you to have a great understanding of how this technique works to see if it is right for you or someone you know. For starters, you should know what a dental implant is. When one receives a dental implant there is a small titanium screw that replaces the root, part of the missing tooth. The screw fits inside of the jawbone perfectly. This procedure of placing the screw is considered a minor surgery and is required in order to place the implants. When the screw, or implant is properly placed into your jaw, we then attach a crown. Aesthetically, you will have a tooth that looks realistic and it is functional for you. The great thing about All-On-4® dental implants is that you don’t need to place an implant for every single tooth that you are missing. All we will do at Ace Dental for you All-On-Four® implants is given you four perfectly placed implants for your top arch and four implants on your bottom arch. Between the 8 implants in the whole mouth, your smile will be completely restored. This is the excitement behind All-On-Four®. Another great benefit of using the titanium implant is that this material comes with the unique ability to fuse. The living bone in your jaw will fuse to the titanium screw. This is great because you will never have to worry about your new pearly whites falling out. Your new smile will be long-lasting, and strong and give you the confidence that this is a permanent fix. In addition to the fusion that takes place with the implant and your jaw bone, there is another benefit. The fusion prevents any future loss of bone that could possibly happen in the jaw. 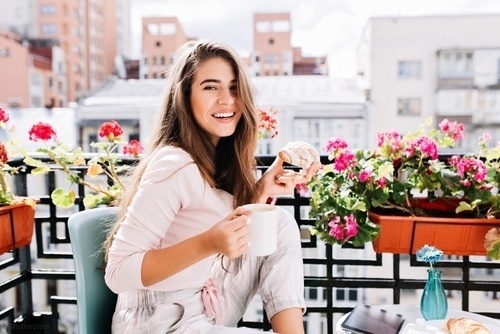 You will be able to enjoy a more youthful facial structure because of this procedure and don’t forget about better oral health! Will All-On-4® dental implants, you will love all the amazing benefits, but you will most likely be grateful for the quick transformation that comes into your life because of your great smile. Ace Dental Care provides affordable implant treatments for you. All-On-Four® implants is a procedure that we do offer financing for. If you are interested in seeing if you qualify for financing please fill out the credit-application on the financing page. In addition to offering to finance, we will do our best to represent you when working with your insurance company. • Feels closest to natural teeth. • Bulky appliance and can be uncomfortable. • Does not move • Can fall out. • Preserves Bone • Denture sores may occur. • Ability to taste food • Will continually need to be refitted and replaced. • Gain up to 95% of your natural ability biting force • Requires adhesive to secure and may affect the clarity of speech. At Ace Dental Care, All-On-4® dental implants can transform your smile into something new in just a few visits. 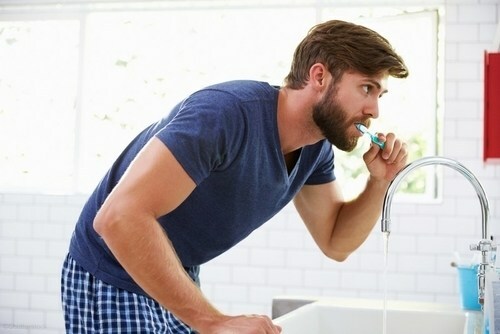 At Ace Dental, we offer all our patients a free consultation. During the consultation, our implant team will perform a Scan. It is through the results of the scan that we determine the need of implants for you, and assist us in creating a customized treatment plan. If you have a desire to learn a little more about all in four dental implants and our course of treatment, call us today and we will schedule your free consultation. This is the best way for you to know how our implant team can transform your life!